The Temescal restaurant serves amazing kitfo and other traditional dishes. At lunch, Abesha’s veggie combo is a steal at $8. With at least 20 Ethiopian and Eritrean restaurants across the East Bay, there is no shortage of places to get delicious Ethiopian food. I won't pretend that I've sampled every Ethiopian restaurant in the area, but I have visited several popular hotspots over the years, including Cafe Colucci, Ensarro, Cafe Romanat, and Injera. In recent weeks, I revisited some multiple times. But the one I keep coming back to is Abesha Ethiopian Cuisine. Amesiyas Amha Wube opened Abesha in 2010. His mother had cooked in other Ethiopian restaurants, and they felt it was time for the family to start their own business. Wube's mom remains the daily force inside Abesha's Temescal kitchen, conjuring magic with spices imported from their native Ethiopia. For most local restaurants, eight years in business is an impressive and, frankly, unusual run. But many of Oakland's Ethiopian spots have been around far longer, developing intensely loyal customer bases. Cafe Eritrea D'Afrique, Asmara Restaurant, and Red Sea, for example, have all co-existed in the same neighborhood as Abesha since the 1980s. 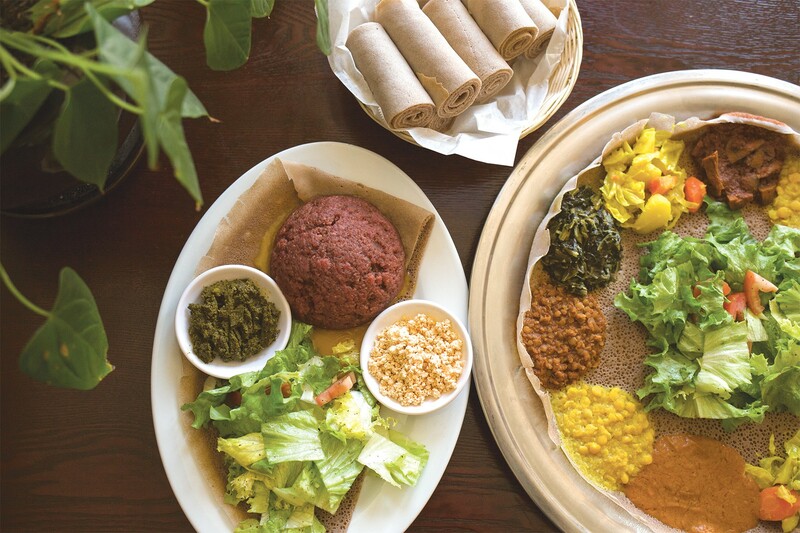 That density of long-running Ethiopian restaurants — not to mention several more just north and south of Temescal on Telegraph Avenue — might explain why Abesha doesn't seem to get as crowded as competitors, nor as much press. Even at prime times, I've never had to wait for a table. Maybe it's because Abesha's prices are slightly higher than average. I think the quality measures up, but if you're uneasy about it, go for lunch on a weekday, when Abesha offers its veggie combo for $8. Though all of Abesha's vegan dishes are strong, the combo is particularly excellent because of its flexibility. Instead of the usual pre-set selection, you get to choose five out of the seven possible dishes, and you can double up on favorites. That means if you're feeling a particularly intense need for greens, you can fill up your platter with as many orders of gomen as you'd like. You can also order any veggie dish as a side at a lower price, which is a nice option I wish more places offered. Those spiced collard greens were excellent, though not nearly as impressive as the lentils. I loved the fiery, berbere-tinged yemisir wot's loose, creamy texture, as well as the mellow nuttiness of the vivid yellow split peas. The sliced cabbage remained light and crisp, and the timatim fitfit, cold pieces of torn injera soaked in tomatoes, delivered a bright, juicy reprieve from stews. The reddish shiro, the gravy-like chickpea staple, lacked the complexity of certain famed versions around town, but I enjoyed it immensely nonetheless. My favorite, the mushroom wot, was savory and saucy, with a meatiness that few vegan options offer. Per usual, the combo arrived gleaming, inviting, and colorful, spread across a giant, thin sheet of injera. Here, the fermented, sourdough flatbread is made of teff and barley. It was slightly tangy and light but also less spongy than most local versions. Still, it soaked up flavors well enough. Unfortunately for gluten-free eaters, there is no 100 percent teff injera available, though Wube said he may seek out a source in the future. The special kitfo comes with cottage cheese and collard greens. If you're a meat-eater, the must-order dish is Abesha's special kitfo. Most Ethiopian restaurants offer this version of steak tartare, but Abesha packs extraordinary warmth into its melt-in-your-mouth, extra buttery rendition. The raw, lean meat is freshly ground to order, so it's luxuriously soft without feeling mushy. Extra chili powder, seasoned cottage cheese, and stewed collard greens arrive on the side for you to mix in to your liking, adding a wonderful depth of flavor. It's the dish you're most likely to see on every Ethiopian party's table for good reason. 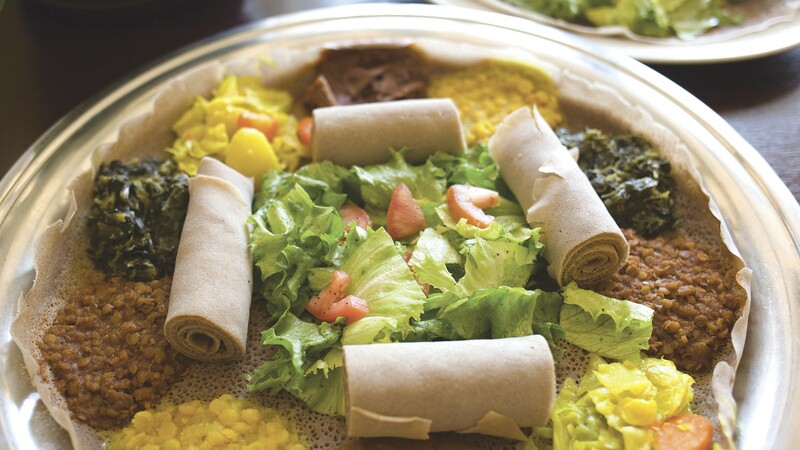 Across the board, Abesha's meats are cooked with care — sometimes so tender they seemed to melt into the injera. This was especially the case with the garlicky, saucy beef wot and the yebeg alicha wot, which featured shreds of lamb in a soothing yellow curry spiked with ginger. The yedoro wot packed a spicy punch, and while the requisite boiled egg revealed a chalky yolk, the chicken leg obediently fell apart when prodded. The lamb tibs — often overcooked at other destinations — offered just a little chew, stir-fried with berbere and garlic. Abesha also makes an appealing fish version, with chunks of tilapia deep-fried until crispy and served with onions, garlic, and sliced jalapenos. If you ask for a dish to be spicy, you'll definitely feel the tingle. But if you'd rather keep it tame, it'll still be delicious. I appreciate that the servers take care to ask about such preferences, and that they're generally kind, laid-back, and efficient. Drink options are minimal — there are only a few beer and wine options. And the honey wine was among the sweetest I've ever tried, to the point of being actively unpleasant. Fortunately, that's not the case with the atmosphere, which leans contemporary, minimalist, and quiet.